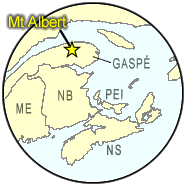 The Parc de la Gaspésie is situated in the interior of the peninsula of Gaspé, in the province of Quebec. 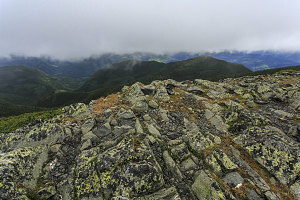 It offers a unique "flat-topped" alpine mountain experience: a large number of peaks, many with summits above treeline, that have been shaved off by continental glaciation and then later incised by valley glaciers. 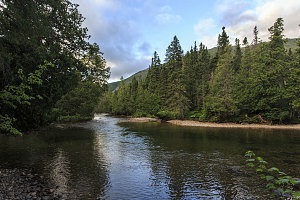 The park is only a 3-hour drive away from the home town in northern New Brunswick that I grew up in. However, despite this relative closeness, I never really visited the place until the summer of 2006, when as part of a trip back to my home town, Jenn and I had a viewless and wet visit to the park's Mont Xalibu. 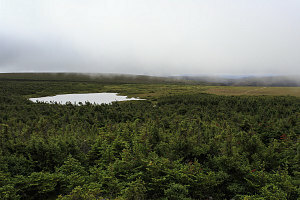 Despite the poor visibility, the visit was enough to confirm that this place was worthy of exploration. So, when back in New Brunswick again as part of my mother's 90th birthday celebrations, I decided to visit again. Since I was in the area for over a week, I made sure I chose a day that had the best possible forecast. 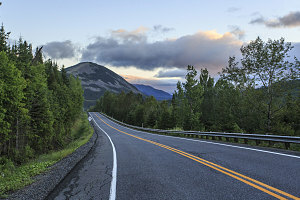 I started driving away from my parents' house in Bathurst, NB at about 3 a.m., with a plan to start hiking soon after the sun rose. 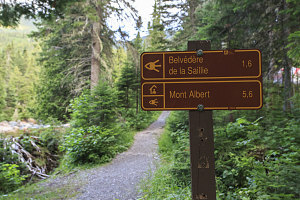 The plan was to climb one of the park's more famous mountain routes: the so-called "Tour du Mont Albert". 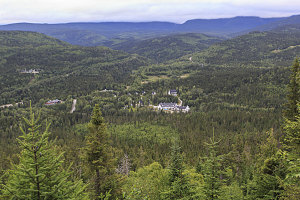 This is a roughly 18-km loop hike that includes a traverse across the high plateau of Mont Albert. 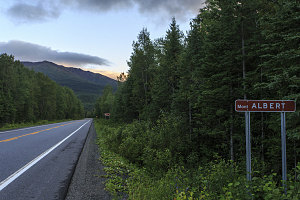 Mont Albert is a very prominent and interesting mountain, partially due to this plateau - a large and barren expanse of tundra and low scrub at an elevation of about 3500 to 3800 feet (~1000-1150m). 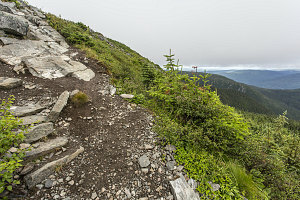 The loop hike ascends one side of Mont Albert, crosses its summit plateau, and then descends into a very interesting glacially-carved valley on the other side. 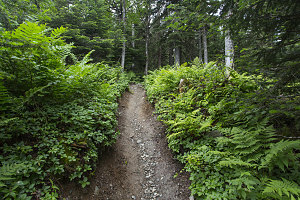 Or, read that last sentence in reverse if you happen to hike it in the opposite direction. 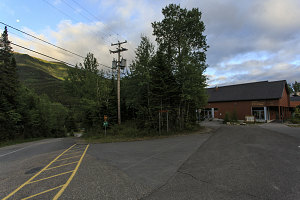 I arrived at the park's visitor / information center at about 5:30am. 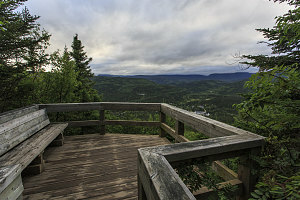 The sky overhead was already getting light, and apart from a scattering of low clouds, the weather looked good. I assumed that the low clouds would burn off with the coming sun. 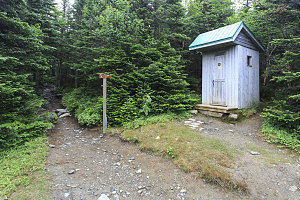 Unlike the visitor-unfriendly setup at Mt Carleton Provincial park in New Brunswick (which I had just visited to climb Mt Carleton a few days before with my sister), the situation here at the Parc de la Gaspésie was straightforward and simple. 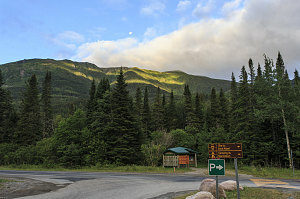 A self-service kiosk outside the visitor center allowed me to deposit my park fee and obtain my park pass, which I was directed to keep on my person for the length of my stay in the park. 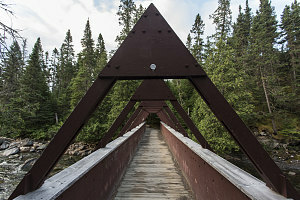 I left my car in the ample nearby parking lot, got my gear together, and walked across the park's main highway - highway 299 - to the well-signed start of the trail up Mont Albert. 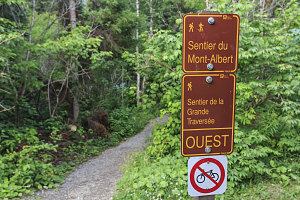 Although there were a number of cross-trails to negotiate, the signage was good enough to make the way to the Mont Albert trail easy to follow. 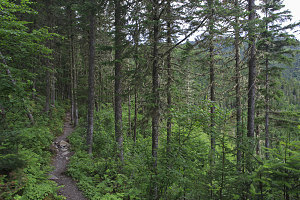 I was heading up in the counterclockwise direction, heading up the trail that climbed the northern flanks of the peak. 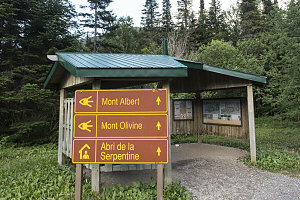 After crossing the Saint Anne river, the Mont Albert trail started climbing. 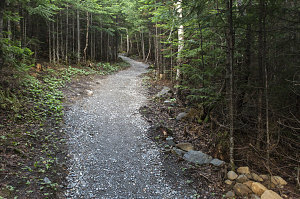 At first the tread was a heavily landscaped, smooth path, complete with a crushed gravel bed. 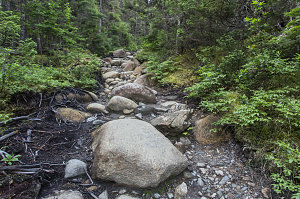 After a few tens of minutes, this gave way to a much more typical super-eroded mountain path, full of boulders. 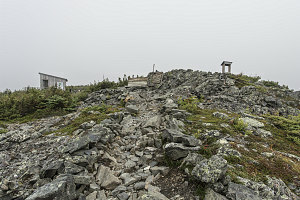 The trail climbed up in a broad circle to a wooden lookout platform - the Belvédère de la Saillie - that offered decent views back down into the valley and to the visitor center / hotel complex below. 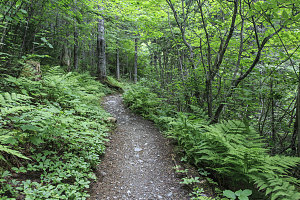 Beyond the lookout, the trail became much nicer. 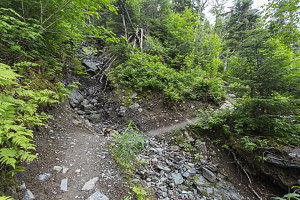 It was far less eroded and wide, and traced its way in an efficient but not steep manner, rising and traversing diagonally across Mont Albert's northern flanks. I was a bit annoyed to notice that, instead of evaporating away, the scattered clouds I had seen at 5:30am had coalesced into a continuous deck overhead. Perhaps, I thought, I'd climb through it and into a beautiful undercast situation? 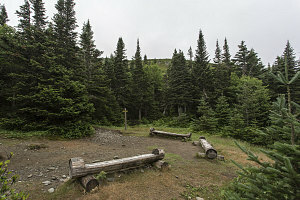 By a quarter after seven in the morning, I arrived at a final clearing before the final slopes to the summit plateau. It was clear at this point that there would still be a solid cloud in place when reaching the top, and - unfortunately - the cloud was positioned such that I'd likely be *in* it, rather than above or below it. Being in a cloud is worse than being above or below it, for all you see in that case is a white mist in all directions. 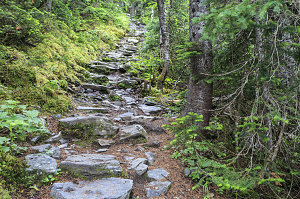 I soon climbed out of the trees and into the alpine terrain at the north rim of Mont Albert's summit plateau. 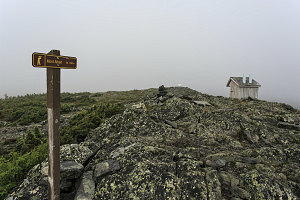 The combination of higher altitude, overcast conditions and a breeze made it quite chilly, even though it was the end of July. A fairly harsh and barren landscape presented itself. 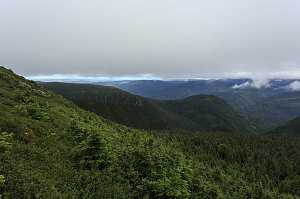 The northern edge of the plateau was bare rock, beyond which the land dropped steeply into the Saint Anne Valley. 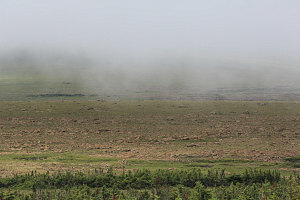 To the south, there was [surprisingly] a band of low conifers, and beyond that (at the edge of vision in the mist) the beginnings of the actual barrens section of the plateau. I say suprisingly, because based on the many descriptions I'd read, I had expected there to be no trees at all atop the plateau.